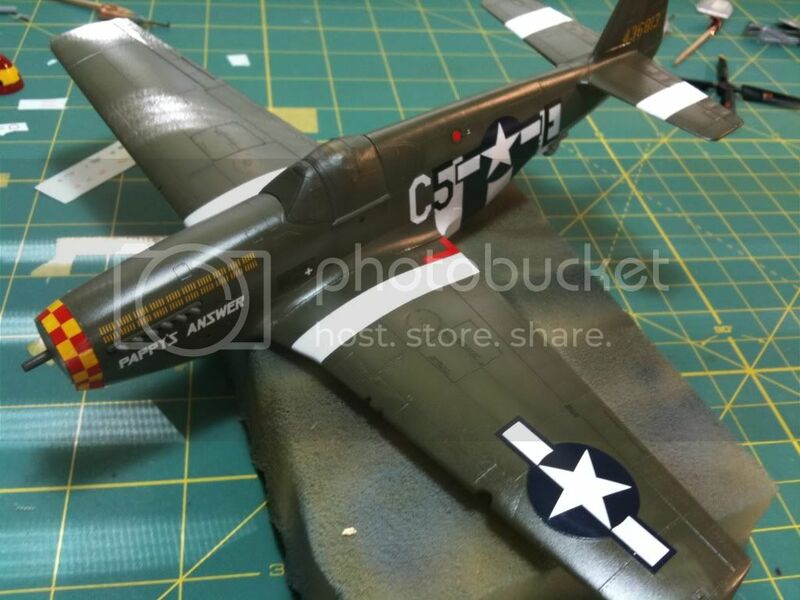 I’d originally intended to build “Hairless Joe” from the old Monogram P-47, but when the 17-year-old decals went awry, I picked up Tamiya’s Jug and started over. And am I ever glad I did. 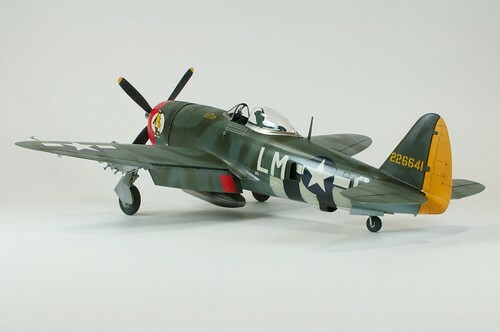 Tamiya’s P-47D is all-around fantastic kit. 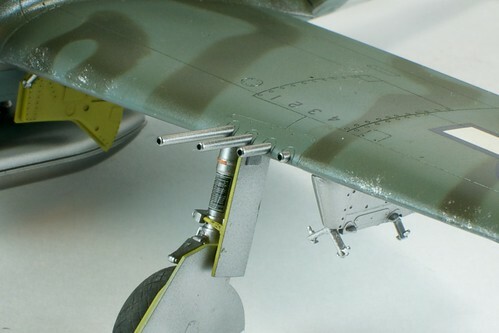 From the cockpit detail to the fit of the wings, the correct angling of the blast tubes, and even the clear navigation light housings, just about everything is pitch perfect. Overall, I have to say this has been my favorite build to date, both in the journey and the end result. I look forward to building many more Tamiya Thunderbolts in the future! I used your method for the D-Day stripes and I must say it was pretty painless. I’ve been dreading painting the D-Day bands, even though I hate using a decal for them!! After a botched decal attempt, I bit the bullet and masked. Even with the ’round’ and ‘not straight’ fuselage bottom of the P-51b, it was pretty painless. I really enjoy the D-Day bands, so now I’m happy to report that it’s no longer a dreaded step, and they look so much better than decals would… easier to weather as well. Thanks for the tip. I liked your efforts on the DDay bands. Was the 51 you worked on a 21st Century? If yes, please email me @rkranias@vt.edu. I have several 21st Century 51B/C & D’s I am planning to custom paint. Me has questions on taking apart prop, wheels, canopy windscreen and general pre-paint prep. Excellent work!!!! I have a question about this particular plane. 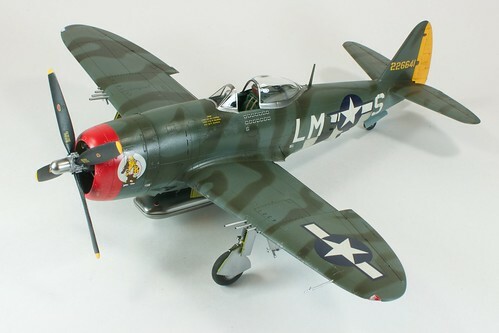 My friend is doing up his Parkzone RC P-47 into “Hairless Joe”. I noticed there is some writing in yellow, just forward of the canopy. Can you tell me what it says, or shoot me a close up pic of it please? THANKS!! !